In class this past semester, we have discussed a number of issues relevant to new media, and how technology is always evolving. One example of this is the idea of how certain communities are meeting less in person, and instead moving to the Internet. The day we discussed this, one particular website came to mind: Patch.com. Patch.com is an alternative news source where people from various communities can come together online and read about what’s going on in their hometown, written by members of the community that are hired to write these articles. The editor of each chapter, as well as the staff writers, only serve their own town/city, which creates a more personalized, homey experience for the people who use this website. Let’s take a look and see what it has to offer! And now for the most important part! I wanted to see what the process was in order to get a Patch started in a new community, so I e-mailed community@patch.com, as well as three different editors. None of them wrote me back, so I asked my mother (who is a staff writer) to e-mail her editor. You can read his response HERE. After seeing his response, it seems that it is harder than one would think to have a Patch started in their own community. I’m waiting on the official message from Patch Headquarters, so STAY TUNED! EDIT: Article about today’s protest on the Harrison Patch. My mom just got a new job at this website called Patch.com. 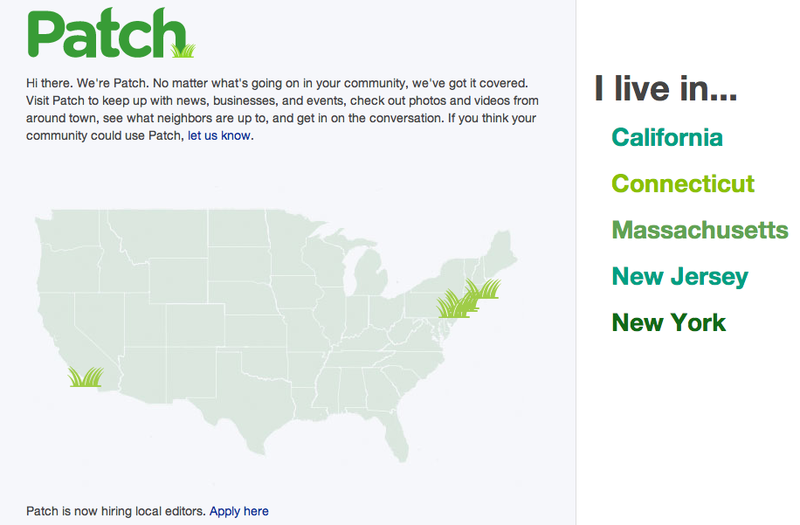 It’s sort of like an online newspaper, but it only covers specific towns/communities. Part of its mission is to try and create more of a community feel than newspapers currently do. So far they have sites (chapters??) in California, Connecticut, Massachusetts, New Jersey, and New York.